It’s Oct 1944. The Americans were about to engage the Germans in what was to be their largest urban fight in the Second World War. Aachen was also to be the first German city captured by the Allies. 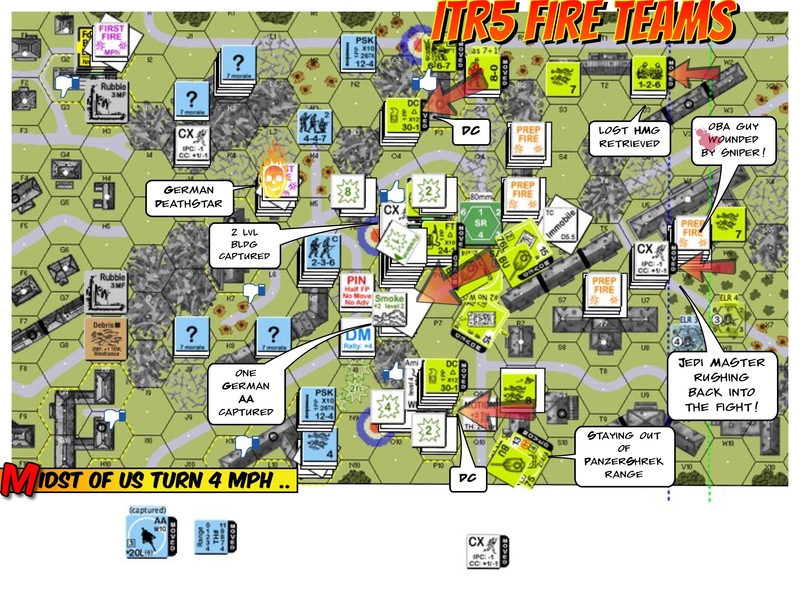 In this “BFP Into the Rubble” scenario, 10 elite & 12 US 1st line squads teamed up with 3 Shermans and 2 tank destroyers faced off against a mix of 18 German squads with mostly 2nd liners, a pair of AA guns and 2 Hetzers. The Germans also had 21 concealment counters, 8 Fortified locations and sewer movement capabilities. There was a lot of rubble. The Americans were to capture 7 buildings in 8 turns. American Turn 2 about to start : The German Fortress troops had a surprise for me. They stacked a few Fortified counters on each other and brought the 37L AA gun onto the 2nd level! This flak gun didn’t have the 2cm FlaKvierling’s “20” firepower but it did have Stielgranate 41 ammo which offered TK# 26 within 11 hexes. The high rate of fire from both AA guns were particularly disconcerting if only for Deliberate Immobilizations. I am quite the novice with AFVs. I decided to keep my tanks together in mutually supporting roles. My AFVs would stick with the infantry (panzerfausts abound) and we would use MGs (and not tanks) against ordnance. Place a squad on high ground. If nothing else to make it harder for my opponent to gain concealment. Squads in high places could interdict as well. Get to the center building (where the malfunctioned Flak gun was). My opponent observed that the center building was the ideal jump off point to the latter portion of the American attack. The German SAN was 5 and I got open top tank destroyers. I got to make sure we got dedicated sniper shielding for our key units! I was on a tight schedule here as the Americans. I pushed on, using smoke whenever possible, dummies or not. One of the first things we found was of course the Flak tower my opponent constructed on my right flank (top of the map). My AFVs then slid towards the middle of the map. End of German Turn 2 : The Americans managed to push to the middle of the board. The AA Gun commanding the middle of the street immobilized one of the Shermans. The American 10-2 (aka Jedi) Deathstar got taken out as well. However while the other AFVs spun towards the middle of the board to avoid the Steilgranate wielding Flak tower, a lone Sherman remained to provide smoke cover for the infantry (Errata : The 37L AA gun’s actually on the 2nd level, not the 3rd). The Americans deployed 4 half squads towards the back to screen off the German sniper, and they took a few hits. Unfortunately the German sniper killed 2 out of 7 American leaders, something the Americans could ill afford with their lower morale. The American sniper relocated to the vicinity Before the game is up, the Germans would see their SAN reduced from 5 to nothing by Sniper-on-Sniper action! 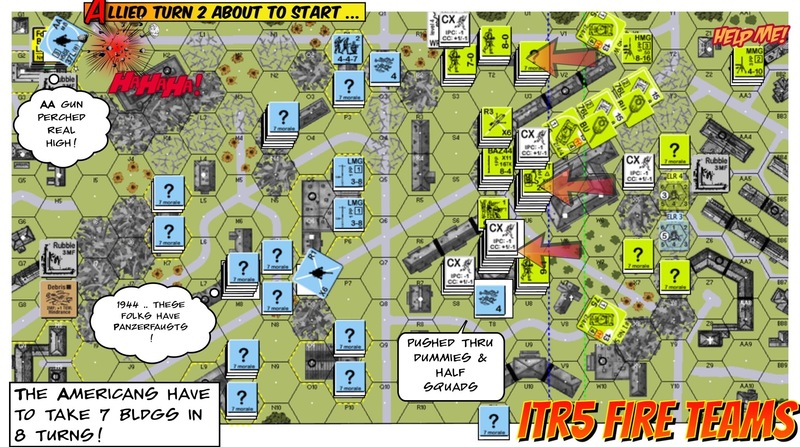 In the midst of American Turn 4 : The Americans pushed forward and captured the lone AA gun in the middle of the board. American leaders continue to be shot by the German sniper. The latest victim was the radio guy who was in the midst of relocating this radio. The Jedi Master and his HMG team took the chance to rush past the sniper. Towards the sound of gunfire! The Americans took the center building, we just needed to remember to get guys upstairs. Towards the bottom of the map, the infantry continue to lead the way with AFVs coming in as support. End of American Turn 6 : Two more turns to go and the Americans still got 2 or 3 buildings to take. We were definitely running tight on time. 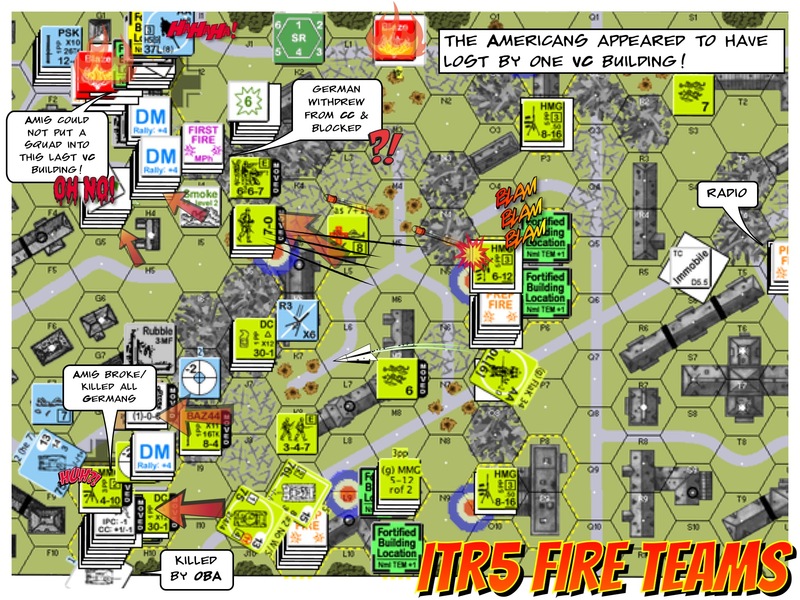 From the right flank (top of map), the American OBA put the Flak tower’s stairwell on fire! The gun crew was therefore encircled. The German brokies were blocking the approach from the American forces though. On the left, a Sherman got blown up by a German squad who found a panzerfaust. An American flamethrower squad hopped by and broke the half squad involved. 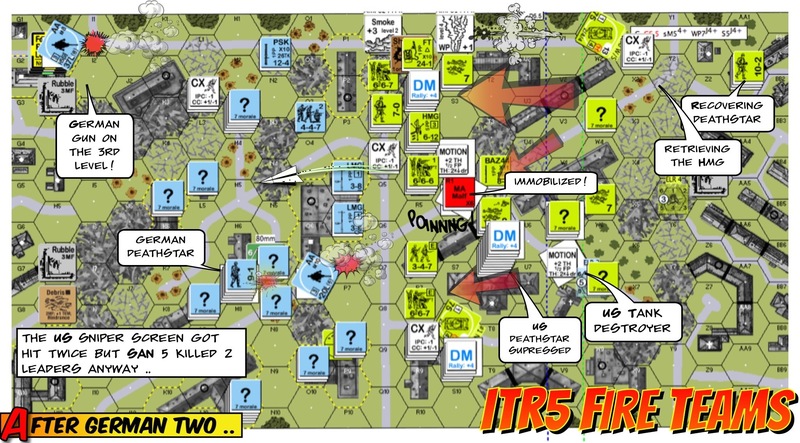 That gave the other American AFVs time to push the wreck out of the way and to get into position for an assault on the final VP building on the left flank (bottom of map). The German Hetzers were about to enter from the left of the board. After American Turn 7 : Encircled as it might be, the German Flak tower was still in the fight. It blew up the TD that rushed over to help! Nearby MGs were engaging it, as was the captured AA gun from the middle of the board. We got a little thin on our right but the lay of the rubble made it hard for us to rebalance. The wounded artillery observer brought fire down on the left flank target building to good effect. The Americans on the left flank got ready to hit the building in the last turn. End Game : The OBA on the left flank (bottom of map) broke some German units and even killed a Hetzer as it tried to move towards the Americans. On the American right (top of map), the US forces had nothing but open ground to traverse unfortunately. We tried to shift as much forces as possible to the right but having to get around the German brokies proved to be fatal!! The Americans therefore lost this scenario by one VC building! Thoughts? What would you have done better? What do you think of the tactical choices? Would you try this scenario Please comment! 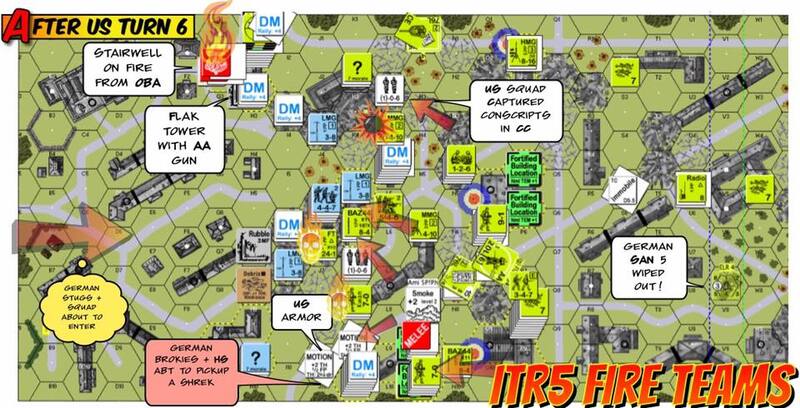 This entry was posted in Game Play and tagged AAR, Advanced Squad Leader, Board Game, ETO, Hong Kong, VASL, wargame. Bookmark the permalink. Hey Jackson, loved the AAR and will give this one a try soon. However, unless there was errata I missed for the scenario, both AA Guns are 20L. There is no 37L one in the OOB, hence no Stielgranate paranoia was necessary. Even if it was in the OOB, the Basic Hit # for it is 11 and decreases by 1 for each hex of range. 6-hex range at a stationary Sherman (large target) is a ‘6’ TH with no other modifiers present. I agree that if it hits you are screwed, but at 6-hex range or better I wouldn’t overly worry about it. Great point Chris! The Germans took the balance, which is to switch the 20L to a 37L. Having said that, great pointers regarding the range though. Will stay at more than 6 hexes – great for avoiding Deliberate Immobilization anyways! Great write up. The Sniper…an asset never to be underestimated in ASL. I had the chance to wander around Aachen in 1985. It remains one of my favorite German cities. Probably all rebuilt I guess? From the amount of destruction I see in the pictures. That must be an interesting place to visit. Loved the AAR Jackson. One thing I suspect which was done illegally….when relocating a sniper, it must be placed under the same restrictions as initial set up )ie within 6 hexes of 6 enemy hexes if at all physically possible to do so. If not, then 5, then 4 etc. This makes zeroing in on someone’s sniper a whole lot harder. Oh … you are right! Thanks for this!! One other comment…. Unless I’m mistaken AA guns are specifically excluded (B23.93) from upper levels even in fortified locations. I don’t know what kind of shenanigans your opponent was up to, but neither of those AA guns are eligible for Stielgranate 41 ammo. That would be the 37L AT gun only. Finally got to play this one recently, and found it heavily pro-US. I put all four HMGs w/ four HS and the 10-2 in W4-2nd level. 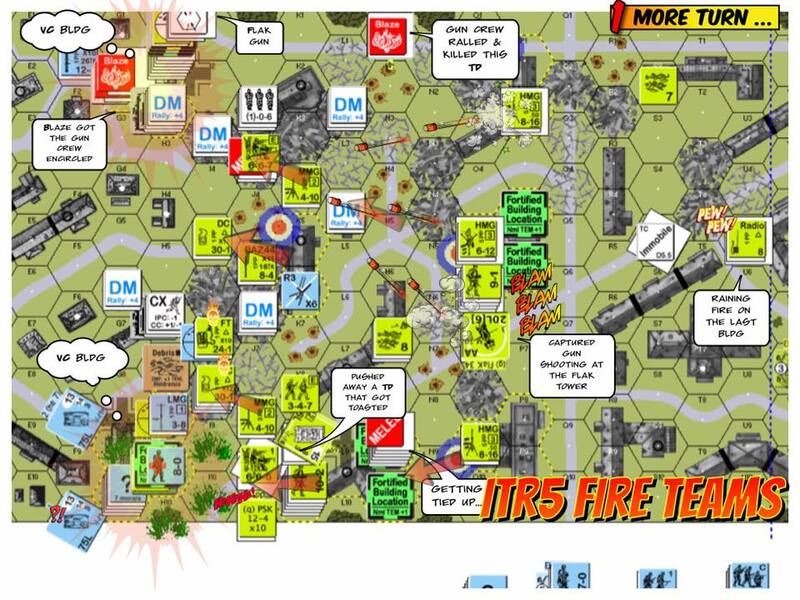 T1 PFPh, they tore up the northern quarter of the map, then advanced into V4. They had 1/2 the map under considerable duress until advancing into U5…..where the world was their oyster! Germans were forced to hole up in the backside of the VC buildings to avoid vaporization, 30 (+2) if Fortified! Amis had all 7 buildings by T6 when the Jerry reinforcements arrived, but had them all well infested. German conceded before even bringing them on as they wouldn’t have any chance of retaking any of them. Fun in its own right, but somewhat of a letdown compared to the superb quality/balance of others in the pack. Right – ROAR has it at 11:17 for the Americans as well. Hmm!